Support for the period of one year is usually included in the purchase price of our products. Products are also supported via an active web forum. You can of course send e-mail to support@wptools.de. We also offer VIP support – this includes priority email support and all upgrades. Please ask for a quote. Can our chief developer help you with Your Delphi or C++Builder project? This service was very productive for several companies in the past, since problems which would have taken a log time otherwise, were solved by the expert with a few hours. Typical cost for this service are €800 per day with 2 day minimum + travel/accommodation expenses. General: Our VCL products support C++Builder 5+6, Delphi 5-7, Delphi 2005 Win32, 2006, 2007, 2009, 2010, XE and later. wPDF also supports Delphi 4+3. Minor upgrades are free. Our wPDFControl and wRTF2PDF consist of an interface OCX and a versatile DLL. 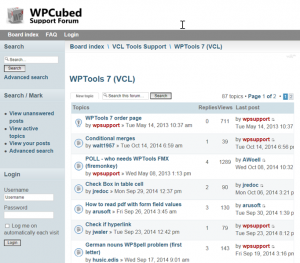 The new wPDFControl V4 includes 64bit support! They can be used with many developing languages, such as VB and VC. WPViewPDF is a windows-class component and can be used in various development systems. It comes with a VCL and .NET wrapper and an OCX. As is usual, distribution with developer applications (libraries of any kind, modules, ActiveX, OCX, VCL, DLL) is not allowed and requires a special arrangement with us. WPViewPDF includes a few non competive restrictions. The distribution license further requires that the license agreement is fully accepted: Each developer who is working in the project which makes use of WPTools, wPDF or other products needs a developing license, no matter if he or she is actually working with our product or just using the functionality indirectly because it has been embedded into a “package” or external EXE. If you have multiple developers we suggest to acquire a SITE license.